In a saucepan over medium heat, simmer berries and water for four to five minutes, until just warm and syrupy. Mash slightly with a fork and set aside to cool while you peel, de-seed and dice papaya. Spoon 2 tablespoons muesli (or granola) into the base of four glasses. 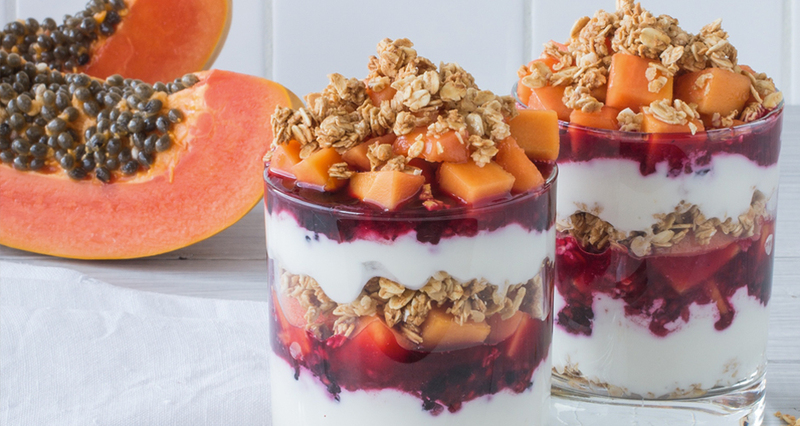 Layer each glass with ¼ cup yoghurt, 2 tablespoons berry compote, ¼ cup diced papaya and 2 tablespoons granola. Repeat layers and serve immediately.